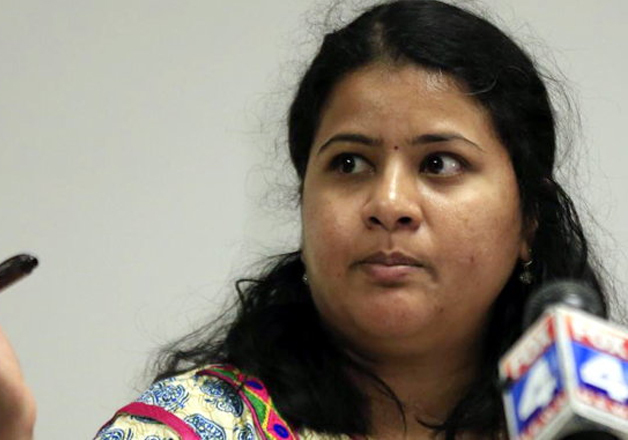 Sunayana Dumala, the wife of Indian engineer Srinivas Kuchibhotla, who was shot dead by an American Navy veteran, has said that her husband 'didn’t deserve a death like this’ and wondered ‘what America will do to stop hate crimes against minorities’. At a news conference on Friday organized by Garmin, where her husband worked before he was shot dead on Wednesday, she said that she had her doubts about staying in the US but was assured by her husband that ‘good things happen in America’. The widow of 32-year-old techie said that reports of bias in the US make minorities afraid and questioned ‘do we belong here?’. Consul General of India in Houston Anupam Ray is supervising the current situation and providing all possible help for the grieving family and the community in Olathe area of Kansas. "Immediately when the incident occurred, Consulate rushed Deputy Consul RD Joshi and Vice Consul H Singh to Kansas to be with the family of Srinivas at this trying moment," Ray said. Ever since, they have been with the family of Srinivas and have assured Sunayna of all possible support and help at this grieving moment, he said. Consul Joshi also met the shocked and frightened Indian community in Olathe and Alok Madasani injured in the shooting on Wednesday night. Madasani is now stable and has been discharged from the hospital. A third person, an American man identified as Ian Grillot, 24, who tried to intervene also received injuries in the firing at Austins Bar and Grill in Olathe in Kansas City in the US state of Missouri. A University of Kansas Hospital spokeswoman said he is in fair condition. The incident evoked outrage from in the US and India with External Affairs Minister Sushma Swaraj expressing shock over the incident. "I am shocked at the shooting incident in Kansas in which Srinivas Kuchibhotla has been killed. My heartfelt condolences to bereaved family," she said in a tweet yesterday. The shooter, Adam Purinton, reportedly got into an argument with the victims in the terms of racism, and shouted "get out of my country", "terrorist" before shooting them. He reportedly provoked them into an argument asking about their presence and work in his country, and how they are better than him. According to police, Purinton left the bar after the argument and then returned with a gun and shot the three men. He was arrested on Thursday, five hours after the incident and charged with one count of premeditated first-degree murder and two counts of attempted premeditated first-degree murder in Johnson County, Kansas, District Attorney Stephen Howe told reporters. Howe, however, declined to elaborate on the motive of the incident, although local police said they were working with the FBI to investigate the case. The FBI was looking at whether it was a hate crime. An FBI spokesperson said agents and police canvassed the area on Thursday and the investigation continued yesterday. Some eye-witnesses have said the attack was racially motivated. One bystander told the Kansas City Star that the gunman shouted "get out of my country" before shooting the Indian victims. The shooting incident comes at a time when hate crimes and acts of bigotry have risen notably in America after President Donald Trump came to power. "Unfortunately, two associates on our Aviation Systems Engineering team, Srinivas Kuchibhotla and Alok Madasani, were shot. We are devastated to inform you that Srinivas passed away and Alok is currently recovering in the hospital," Garmin said. Kuchibhotla and Madasani hailed from Hyderabad and Warangal respectively. Kuchibhotla posted on LinkedIn in 2014 that he managed helicopter programmes. He had a master's degree in electrical and electronics engineering from the University of Texas at El Paso. He earned his bachelor's degree from the Jawaharlal Nehru Technological University in Hyderabad. A 2014 post on LinkedIn said Madasani was an aviation programme coordinator manager at Garmin.